You guys, listen. I decided to let Isabella help with dinner. Like, truly help. Finding a recipe easy enough for her to actually take part in, as well as something she’d eat wasn’t hard at all! I simply turned to KP’s collection of Gooseberry Patch cookbooks! There were four cookbooks that I kept going back and forth between for a good recipe. Ease and time are primary factors for me when it comes to cooking. I don’t have time for elaborate meals that take a ton of time; who does? Most of the recipes in Gooseberry cookbooks are not complex, which is great! I do have some top-choice cookbooks for the busy person who is low on time. If you like coming home to a meal already done, then slow cooking is for you! Also, the fewer ingredients and dishes I have to use, the BETTER. Don’t you agree? Gooseberry has a great assortment of cookbooks for any occasion. I ultimately decided to use the Kid-Approved Recipes book. 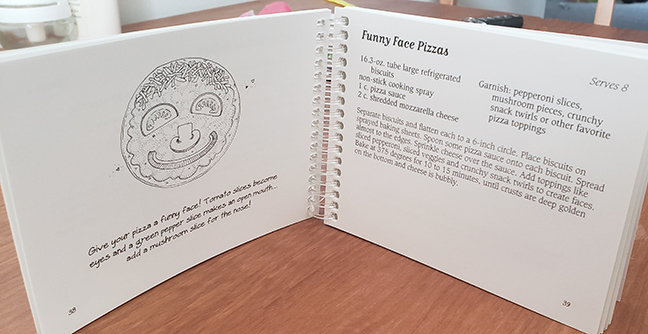 There is a cute little and super easy recipe for “funny face pizza.” Isabella loves pizza, just like her momma, so I figured this would be a total win! 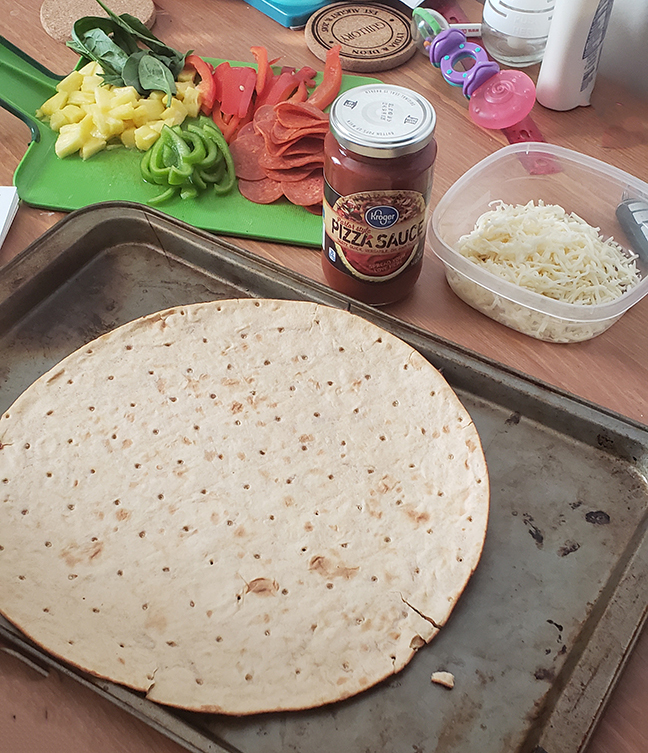 I didn’t do exactly what they suggested since I already had pizza crust at home, and the recipe suggests getting a tube of biscuits. I think I’ll go that route next time; I like the idea of little personal pizzas! After we got home, I cleaned up the table, and got the ingredients together. In regards to the pizza station setup, I wanted it to be easy enough for her to do what needed to be done but not so easy that she’d make a mess faster! Having ingredients close enough for her to see but just out of reach, was perfect. After I set everything out, reality set in. We’re really going to do this! I started to panic. Haha, just kidding! Aside from a pile of cheese on the floor, and saucy clothes, it went PHENOMENALLY! She seemed to really love doing this. I mean, check her out being a little Emeril Lagasse with the cheese! BAM! The finished product! Such a cute idea! And when kids are a little older and understand that they are making a face, it is probably even more fun. Isabella knows “ears” and “nose” pretty well, but all other aspects of the face are a bit lost on her, lol! PIZZA! PIZZA! PIZZA! She was pretty excited and dove right in. For two bites. TWO.BITES. Then she started asking for “fishy!” (Goldfish crackers) and “spetti!” (spaghetti). Classic toddler. I think Isabella would appreciate being able to help more often. She is at the age where she wants to be in the mix of everything, learning, and exploring. She is such a little sponge and learning something new every day! On to the next adventure! So tell me, what are some of your favorite cooking memories from your childhood? Style on a Budget: Top 10 Fall Items Under $20! Festive Wreath Inspiration for Fall & Halloween! I love your ideas for family time at the table. Will be incorporating those idea with my grandchildren! Thanks for the ideas! That is great! They are going to love it! You will have to let me know how it goes!